Welcome to our condo at the SeaChase Resort. 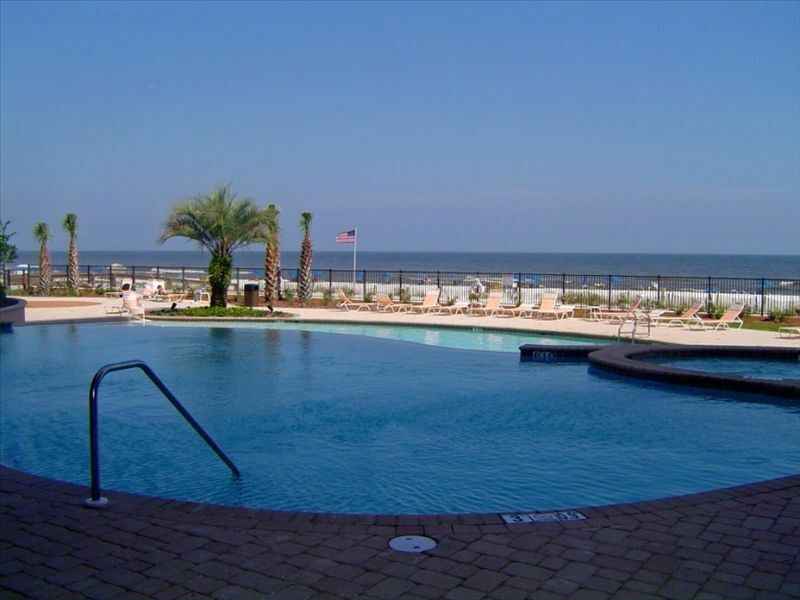 You will love this condo and resort and the BEACH! Located in the heart of Orange Beach/Gulf Shores. Absolutely wonderful Gulf Front condo with fantastic view directly on the beach!! With 3 bedrooms/2 baths and a queen sofa sleeper, you will have plenty of room here! Close to restaurants and shopping. 2-person Jacuzzi tub in master and king bed; queen bed in 2nd bedroom; 2 twin beds in the third bedroom; and a queen sofa sleeper in the living area. There is a fully-equipped kitchen and a full-size washer/dryer in unit. The view is amazing from the 14th floor...Gulf Front and you can watch the dolphins from the balcony! There are 4 outdoor pools, 4 hot tubs, indoor pool, tennis court, fitness center, sauna and a kids pool and splash fountain area! SUMMER Weekly rental is SAT-SAT. This is a NO SMOKING/NO PETS condo and a 3-night minimum stay. All other seasons is 3 night minimum. This is the best location because everything is close and we're directly on the Beach. There are 4 outdoor pools and an indoor heated pool with the best fitness center and pools for kids too. Outdoor grills have been added! Fantastic stay! Great roomy condo perfect for our big family with teens and tots! Loved the view of the beach, the well-stocked kitchen, the pools, and everything! There was room to put babies to bed and stay up and play games around the big table! Even a crockpot ready to use. We all had a great vacation! Thankyou! Thank you all for picking our condo and being my guests. It was a pleasure and I’m so happy you enjoyed everything. We really enjoyed the condo. It was very clean and very well furnished. A lot of room and perfect for our family. Beds were very comfortable. It is also in a very convenient location for anything you would need. Definitely would recommend to anyone. We have stayed several times in this unit and property. It is our favorite! It is comfortable, clean, and safe. Always enjoy dealing with owner....she is wonderful! Thank you SO much for being my guests again and hope to see you in the future! Property was absolutely amazing! Wonderful condo with all the amenities with large bedrooms and comfortable beds. Amazing view from balcony watching the sunrise/sunset and dolphins and very quiet - only hear with waves! Our family was very comfortable and happy there. Very homey and relaxing! Owner very easy and professional to work with and vey informative of attractions/restaurants nearby.. Easy check in and checkout. Owner always available by phone/email and quick to respond. Very enjoyable experience to work with owner. Definitely a winner and look forward to coming back next year!! Thanks so much for sharing your home with our family!! This is a great property. The owner is easy to work with from the minute you inquire about the condo to the refund of your deposit. Clean and very spacious. Large master with king bed. Two smaller rooms for the kids. 14th floor with large deck(great views and no noise from below except for the wonderful ocean...leave your doors open all day). Excellent location. Within easy walking distance of Waffle House, Walmart grocery store, and liquor store. We explored the area every day and found SeaChase to be in the best location within Orange Beach. Attractions in and around Orange Beach: Arcade for the kids, Gulfshores State Park, Blue Angels on Tuesday/Wednesday. Things to do on the beach: Relax, fly a stunt kite, drink beer. This beach is beautiful and very clean. White, powder sand. Not many at all. The Wifi is weak but if you are worried about connecting to the outside world while on vacation, then you shouldn't go to the beach. We are ready to return ASAP!! !